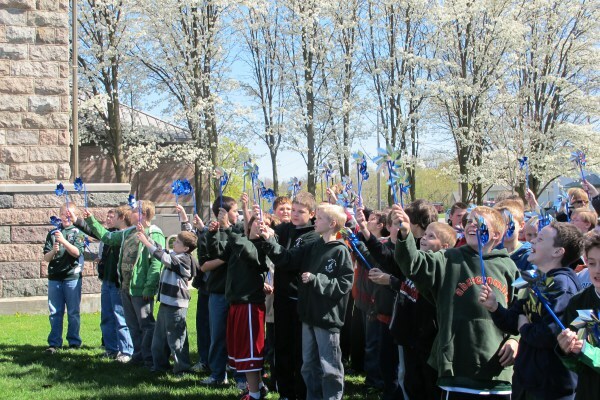 LACASA Center’s Child Abuse Prevention (CAP) Council hosts its annual Plant a Pinwheel Celebration each April to commemorate National Child Abuse Prevention Month. This year’s event is set for Wednesday, April 4, 2018. The community gathers at the Howell Carnegie District Library for a presentation on child abuse prevention. 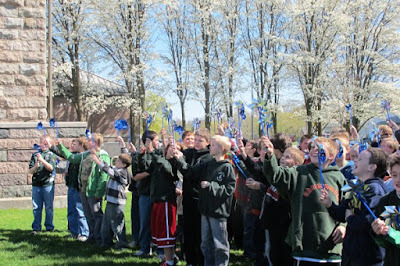 The event culminates with children from area schools planting a Pinwheel Garden along the library’s front entrance. 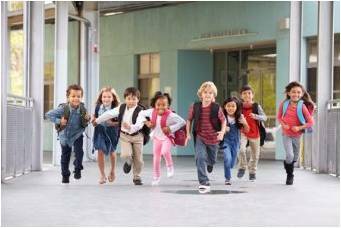 If your school, business or organization would like to plant a pinwheel garden in April, please contact LACASA’s CAP Coordinator, Holly Naylor, at 517-548-1350 or hnaylor@lacasacenter.org. Please join us in recognizing this national month and building awareness about how to prevent child abuse in our community. Pebbles Has Made An Amazing Recovery & Is Ready To Be Adopted! Hi! 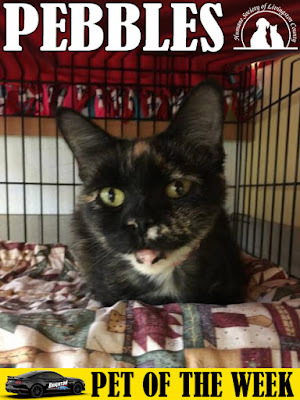 My name is Pebbles and I am a 10 year old (spayed) female, shorthair Tortishell cat! I am amazingly social and I LOVE people!!! I get along well with small dogs, cats and children but prefer a more quiet home if possible. I'm not quite sure about playing yet because I came from a house that was overrun with other cats and playing wasn't something I was able to do; I'd love for someone to be patient and show me how to do that! 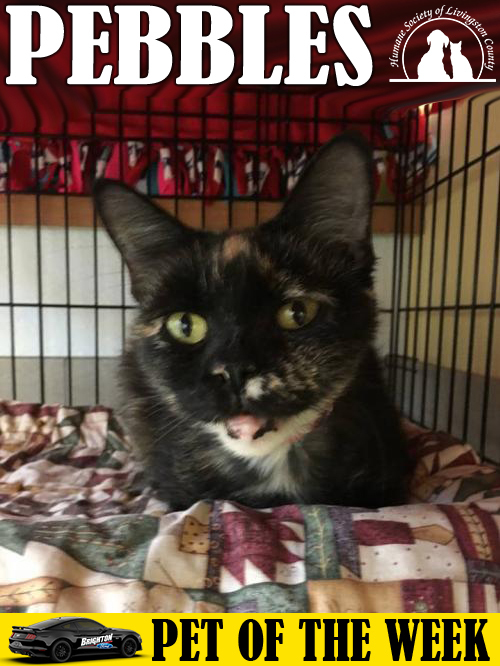 When I came to the Humane Society of Livingston County, I was so thin and sick that I could barely breathe and all my teeth were rotting out of my mouth, but since being in a foster and having all my teeth extracted I am loving life!! I eat extremely well and have gained 2 whole pounds!! Occasionally I will sneeze and my nose occasionally runs, but I think this is from my history of never having treatment for this before. I also have a runny left eye occasionally but all my foster mom does is wipe it once a day with a warm, damp washcloth - it doesn't need medication or anything! My favorite thing is being by my human family and being pet and loved! I will lie by your feet while you watch TV or read and enjoy being the center of attention! I purr non-stop and would love a family with other animals in the home or children that will surround me with love and attention for the rest of my life!!! Brighton Ford has used lifted trucks!!! We have lifted Rams, F-150s, F-250s, Silverados and more at our dealership near Genoa Township at I-96 and Grand River in Brighton, Michigan! Most with 6” custom lifts and custom wheels and tires to match. Some of the lifted trucks have custom leather interior, running boards, bed liners and more! Find a used lifted truck for yourself at Brighton Ford today! -2016 Ford F-150 XLT with custom 6” lift, custom wheels, custom tires, 4x4, tow package, navigation and more! -2017 Ram 2500 SLT with custom 6” lift, 4x4, custom wheels, custom tires, low miles, clean CARFAX history and more! -2017 Ford F-150 XLT SuperCrew with custom 6” lift, 4x4, custom off road wheels, custom off road tires, leather interior, bed liner, running boards and more! Not sure if you prefer a lifted F-150 or a Dodge Ram? Stop by our used car dealership and take them all for a test drive to find the best fit for you! Looking for a car on a budget? Brighton Ford has 19 used cars under $10,000! Monthly payments starting as low as $79/mo! How does 42 miles per a gallon sound to you? This used Ford C-MAX Hybrid SEL gets the best fuel economy! The black 2014 Hybrid C-MAX only has 46k miles and one previous owner. This used Hybrid has lots of options, from heated seats to push button start and leather to clean CARFAX and so much more. Come take a test drive at Brighton Ford, just minutes from Lyon Township and Genoa Township at I-96 & Grand River. Call for details 810-227-1171. Did you know that you can open the tailgate on your 2018 Ford F-150 with the click of a button? The 2018 Ford F-150 has an available remote tailgate release option on some models. 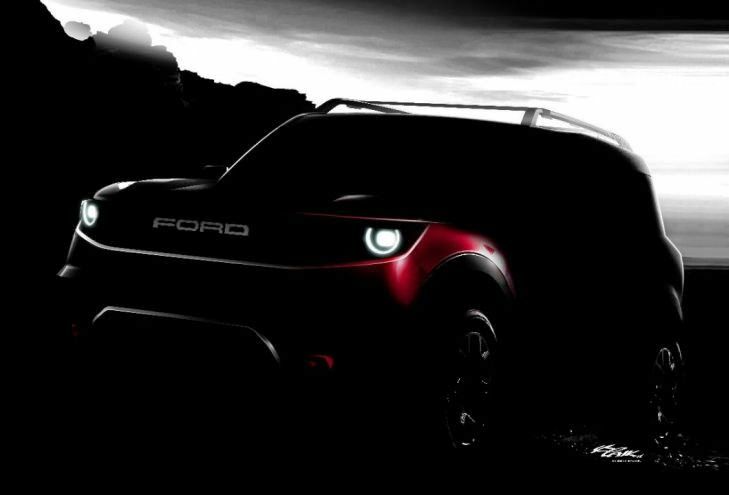 This is the industry-first remote tailgate release and it’s awesome! If your hands are full and you need to load items in your truck bed, this option is undoubtedly amazing and practical. Simply click the tailgate release button twice on your key fob and your tailgate will automatically open. It’s that simple!!! The available remote tailgate release lets you lock or unlock the tailgate with the key fob or the inside door switch. Release the tailgate with the key fob, too. It’s among the features that redefine the work space of the F-150 pickup bed, such as the integrated tailgate step with lift assist and deployable box steps. As an added bonus, you can lock and unlock the tailgate via your key fob as well. When you click lock on your key fob, your doors aren’t the only things that lock up, your tailgate does too. This is true for unlocking it as well! 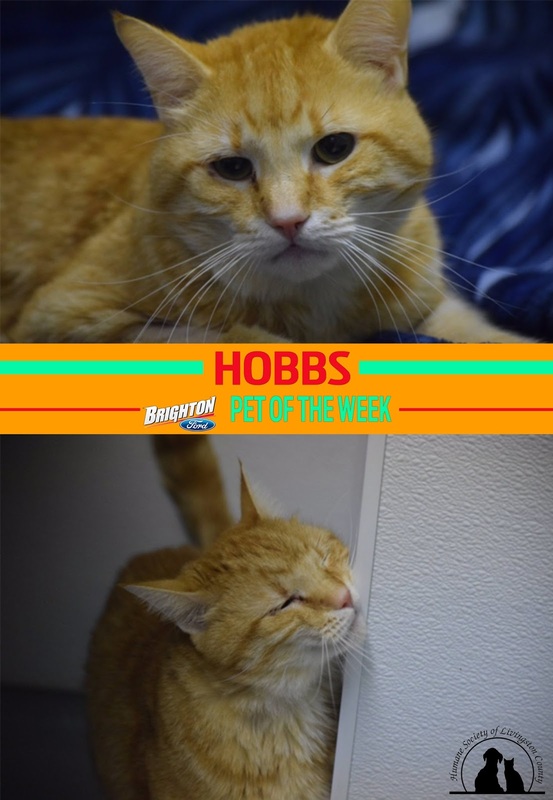 They call me Hobbs! I am an adorable, one year old, short hair, orange tabby who already had a very rough experience in my young life and almost did not survive! I was rescued by another shelter and then transferred here in desperate need of urgent medical care after suffering from extreme malnutrition, fleas and dehydration. Thankfully, I received the medical treatment and loving care in a foster home until I was healthy and now ready for adoption! I am still adjusting to being at the shelter and don’t like being confined in a cage or carrier, but once I am out, you will find I am a really sweet, playful, young boy who likes your attention and would be so happy to grow up in a loving family! This used Kia Soul is a slick Caribbean blue that gets 31 mpg on the highway! Its’ 2 liter 4 cylinder engine will get you moving while getting awesome fuel economy! What’s really great is this used wagon in Brighton, MI has 5 out of 5 star crash test rating, so you can feel safe while cruising in style. This 2016 Soul is a local trade-in with a clean CARFAX. Brighton Ford just reduced the price to $15,342 to move this Kia Soul! Interested? Schedule your test drive by calling 810-227-1171. Two hot cars at Brighton Ford are the Ford Fusion Sport and Ford Fusion Titanium! These loaded versions of the Ford Fusion sedan have so many options that our customers really love! Some of the options included in these editions of the Fusion are heated steering wheel, heated leather seats, continuously controlled damping suspension, EcoBoost engine, intelligent AWD, 19 inch premium wheels, premium sound and so much more! With only limited supply left in stock, we have highly discounted the demo models for the Fusion Sport and Fusion Titanium. Save over $10,000 off MSRP with your Ford A-Plan discount! That’s right, over $10,000 off these fully loaded new Fusion models! Give our Sales Managers a call for details on these special discounts (not shown on our website) at 810-227-1171. 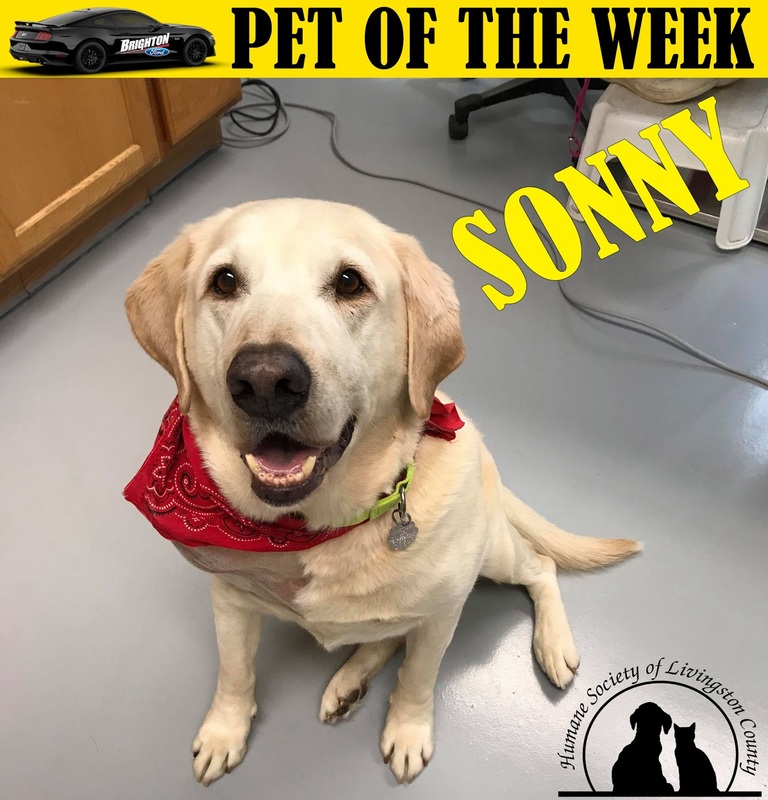 Adopt Sonny, The Yellow Lab With An Amazing Story! Hi, I'm Sonny! I'm an 8 year old yellow lab. I'm a neutered male and I’m updated on all of my vetting! I came here from another shelter where I was found as a stray. When I got here I had a mass on my shoulder the size of my head, and the vet staff ran a test and found out I was also heart worm positive. I went into surgery to have my mass removed and Dr. Amy removed as much of the mass as she could, but it was intertwined with my muscle so she could not get it all. I then went home with one of the vet techs to recover, and that is where I will stay until I am adopted! My mass was benign, although it is something that may grow back slowly. I am staying with 2 other dogs and 2 cats right now. I don't mind any of my roommates, but I do not want to play with them. I have my own room in my foster house so when they are being annoying I have somewhere to get away from them. I LOVE my toys especially my tennis ball to play fetch with! I will throw my toy at you over and over again until you throw it for me. But since I have heart worm, I'm not supposed to play which is pretty frustrating for me. I had my heart worm treatments but it will take me about 6 months to fully recover from it. In that time I must stay inactive, so that my heart has time to heal. I am a very good boy in the house. I will not get on the furniture, even though my roommates do. I just like a warm blanket to lay on the floor next to your bed at night! If you sit on the floor with me sometimes I like to sit on your lap, until I find another toy I want to play with. I also have a human foster sister who is only a year old, and even though she wants to climb all over me, I really like her! 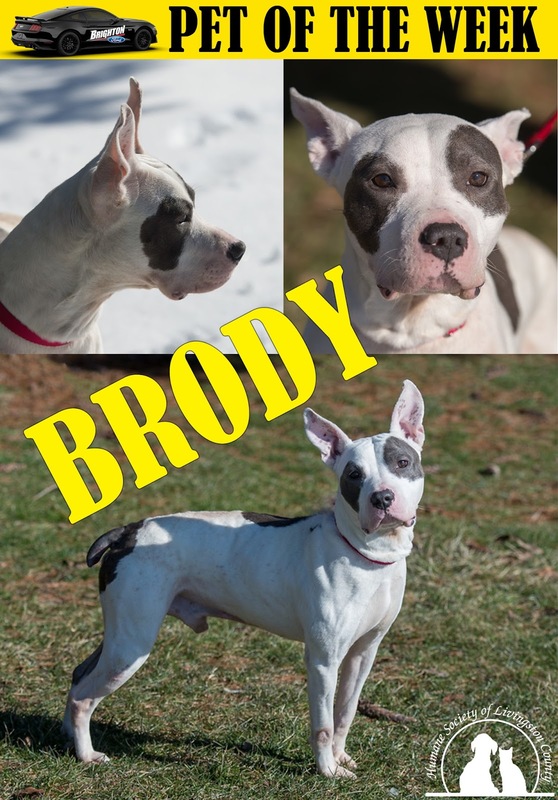 I would be an amazing addition to any family, all I want is to have a human to love me and play fetch with me! 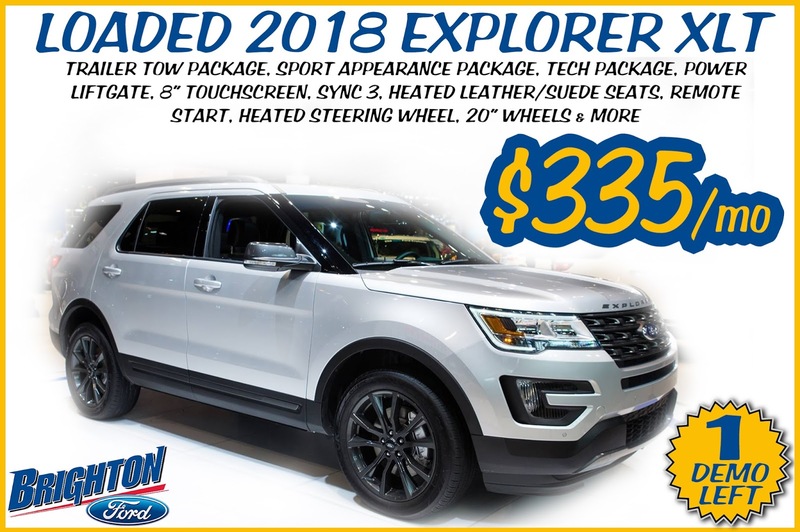 DVD headrests, navigation, heated and cooled leather seats, one previous owner, low miles, AWD, back-up camera, running boards, oversized moonroof and darn near every other option you can imagine is on this 2014 Expedition EL Limited! As if that’s not enough, this used Expedition also comes with a 100,000 mile warranty, 24/7 roadside assistance and more with Brighton Ford’s Certified Pre-Owned Vehicle program backed by Ford Motor Company. The Ford F-150 is no stranger to winning prestigious awards. But this latest win might just be the most impressive to date! Winning major awards is nothing new for the Ford F-150, America’s perennial best-selling truck. But when you take home the gold from an unbiased, independent, and notoriously picky publication like Consumer Reports, it’s certainly worth mentioning. Which is exactly why we’re impressed (but not exactly surprised) to see the Ford F-150 top Consumer Reports 10 Top Picks of 2018 in the full-size truck category. To land on the coveted list, vehicles must be good at everything. Consumer Reports grades them based not only on their own rankings and real-world testing, but also through extensive owner surveys. Overall scores come from a combination of road-test performance, owner satisfaction, safety, and reliability. Consumer Reports conducts over 50 tests and surveys over a half-million owners. It’s about as thorough as an automotive test can get. Couple that with a host of “clever features,” a “spacious rear seat,” and “ample room for tools and gear,” and you’ve got the makings of an outstanding truck. One that stands head and shoulders above the competition, both in sales figures and in the real world. So in case you were wondering, yes, the Ford F-150 is still the best truck you can buy. And, quite honestly, probably the best all-around vehicle on the market, period! Brighton Ford has a highly sought after Ford Ranger with low miles in pristine condition at our Ford dealership near Howell, Michigan! This used Ford Ranger has the 4x4 Sport package, only 42,000 miles and is truly priced to sell at only $18,995. Just go ahead and try to find another used Ranger in this immaculate of condition, we dare you! The interior is as clean as the day it came off the assembly line and the dark shadow grey metallic exterior is super clean as well. Some of the many features this 2011 Ranger boasts are tow hitch, running boards, all wheel drive, cloth seats, cruise control and so much more. Come into the used car showroom at Brighton Ford located at I-96 and Grand River in Brighton, MI for a test drive before you miss out on this amazing used Ranger. Give us a call for details at 810-227-1171 or click here to visit our website for more pictures and additional information on this Ford Ranger. Check out a few of the Ford Certified Pre-Owned Vehicles at Brighton Ford near South Lyon, MI. All Brighton Ford Certified Vehicles come with a 100,000 mile warranty, 24 hour – 7 days a week roadside assistance, passed 172 point inspections and so much more. We have all the used vehicles you want at Brighton Ford, from Ford to Chrysler to GMC to Honda, we truly have something for everyone with our 130+ used cars.